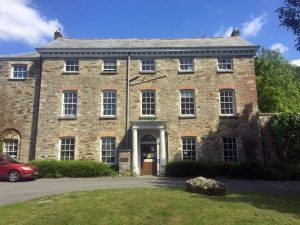 1) (The Priory, Bodmin, co. Cornwall). Ar. on a chev. gu. three roses of the field. Cresl—A squirrel sejant oil a hill vert feeding on a crop of nuts ppr. Motto—Mallem mori quam muture. 2) (John Davies Giddy and his two daughters, who, by royal licence, dated 7 Jan. 1818, were authorised to take the surname and arms of Gilbert only). Ar. on a chev. gu. three roses of the field. Crest—A squirrel sejant gu. cracking a nut or. 3) (Trelissick, co. Cornwall, and Eastbourne, co. Sussex; John Davies Gilbert, Esq., only son and heir of Davies Giddy, Esq., and his wife, Mary Anne, dau. and heiress of Francis Gilbert, Esq., of Eastbourne, assumed, by royal sign manual, dated 10 Dec. 1817, the surname of Gilbert). Same Arms, with a canton gu. for diff. Crest—A squirrel sejant gu. cracking a nut or, charged on the shoulder with a cross crosslet gold for diff. Motto—Teg yw Heddwch. 4) (co. Cornwall, Compton, Bridgerule, and North Petherwin, co. Devon, and Togenton and Bleckington, co. Sussex). Visit. Devon, 1620). Same Arms and Crest, without the cross crosslet. 5) (Locko, co. Derby; originally, at a very remote period, of Gilbert’s Place, parish of Lullington; subsequently of Barrow; William Gilbert, Esq., of that place, purchased Locko, temp. Elizabeth, and was ancestor of John Gilbert, Esq., of Locko, who became possessed of Thurgarton Priory, co. Nottingham, by bequest from the Coopers, and in consequence took the name and arms of Cooper in 1736). Sa. an armed leg couped at the thigh in pale betw. two broken spears ar. headed or. Crest—A dexter arm embowed in armour ppr. the hand darting a broken lance in hend sinister, the point ar. staff or. 6) (Selby, co. Leicester; William Gilbert, son of Hugh Gilbert. Visit. Leicester, 1019). Same Arms, a mullet for diff. Same Crest. 7) (cos. Hereford and Monmouth). Same Arms. Crest—An arm in armour embowed ppr. severed below the wrist, the hand dropping, grasping a broken spear or, headed ar. the point downwards. Another Crest—Out of a mural coronet or, a demi lion ramp. ducally crowned of the first, holding a battle-axe sa. headed ar. 8) alias Kniverton – (Youlgreve, co. Derby, 1300; the heiress m. Barnesly, temp. Charles I.). Gu. a bend vaire ar. and sa. Crest—Out of a ducal coronet or, a griffin’s head gu. beaked of the first. 9) (Savratt, co. Hertford, and Sandwich and Westbury, co. Kent; granted 1593). Gu. a saltire or, on a chief erm. three piles of the field. Crest—A griffin’s head az. beaked or, gorged with a collar erm. 10) (Somerson, co. Suffolk, and London; Sir Robert Gilbert, Knt., co. Suffolk, son of Henry Gilbert, citizen of London, third son of Richard Gilbert, of the first place. Visit. London, 1568). Az. a chev. erm. betw. three eagles displ. or. Crest—An eagle displ. az. 11) (Mayfield, Sussex). Same Arms. Crest—An ease’s head ppr. issuing out of rays or. 12) (North Burlingham, co. Norfolk; confirmed to Thomas Gilbert, of that place, by Cooke, Clarenceux, 1576). Gu. two bars erm. in chief three fleurs-de-lis or. Crest—Out of a ducal coronet or, a stag’s head erm. attired of the first. 13) (William Henry Gilbert, Esq., of Cantley, co. Norfolk; Robert Gilbert. Esq., of Postwick Hall, in the same county; and the Rev. John Gilbert, of Chedgrave: sons of the late Henry Gilbert, Esq., and grandsons of Thomas Gilbert, Esq., of Chedgrave, b. in 1694). Same Arms, bars engr. Crest—A stag’s head or, on the neck a fess engr. with plain cottises gu. Motto—Tenax propositi. 14) (co. Salop). Gu. a bend vair. Crest—Out of a ducal coronet or, an eagle’s head gu. beaked gold. 15) (Brent Ely, co. Suffolk). Ar. on a chev. sa. betw. three leopards’ faces az. as many roses or. Crest—On a mount vert a demi eagle displ. az. oil the breast a mullet or. 16) (Woodford, co. Essex). Same Arms and Crest, with a mullet for diff. 17) (granted 26 Dec. 1759). Gu. an armed leg couped at the thigh or, betw. two broken spears of the last headed ar. on a chief of the second two eagles displ. sa. Crest—On a mount vert an arm embowed in armour or, grasping a broken spear of the last headed ar. 18) Ar. a chev. betw. three negroes’ heads couped ppr. 19) Or, (another, ar.) on a fesse betw. three annulets gu. as many erm. spots of the first. 20) Barry of six or and az. a bend gu. 21) Ar. on a chev. gu. three cinquefoils of the first pierced of the second, a bordure engr. of the last. 22) (Dublin; Fun. Ent. of the wife of Mr. Sheriff Gilbert, buried at St. Patrick’s Cathedral, 17 June, 1651). Ar. a chev. engr. per pale gu. and or, betw. three Moors’ heads erased ppr. wreathed about the temples of the second and third. 23) (Reg. Ulster’s Office, to Sir William Gilbert, of Queen’s co.). Ar. on a chev. sa. three roses of the first, quartering, 1st, Castillon, gu. a castle ar. issuing from the battlements a demi lion ramp.or, a canton erm. ; 2nd, Poyton, or, a bend sa. in sinister chief a rose gu. Crest—A squirrel sejant gu. holding betw. the paws a nut or. 24) or Giles – Or, on a cross sa. five plates. 25) Barry wavy of six ar. and az. 26) (Scotland). Ar. on a chev. az. betw. three trefoils slipped vert as many fleurs-de-lis or. 27) (Dublin; Collection of Molvyeux, Ulster, 1S97-1632). Ou. two bars erminois, in chief three fleurs-de-lis, ar. Crest Out of a ducal coronet ppr. a buck’s head or. This, along with Gilbertson, is a baptismal surname meaning “the son of Gilbert”. It derives from the Old Frankish personal name. Another source states the personal name Gislebertus was introduced into the British Isle during the Norman Conquest. This personal name derives from the German element gisil (translated as pledge, hostage, noble youth) and berth (meaning bright or famous). The surname itself is not very common, but the more than twenty surname founded upon it are (ex. Gibbs, Gibson, Gibbon, Gilson, etc.). One author notes that the Gilbertines were an English order from the 12th century, founded by St. Gilbert (1083-1190 AD), who was born at Sempringham in county Lincoln, son of a wealthy Norman nobleman. Fitz-Gilbert is a Norman French name. One author notes Gilbert means “gold-like bright, or bright or brave pledge”, and derives from the Saxon word gisle, meaning pledge, and the Saxon word geele, meaning yellow. One source says the name arose in the Cornish People, a race of Celtic origin. Common spelling variations of this last name include: Foreign equivalents include Gillebaert (Flemish), Gibert/Gilbert (French), and Gisli-bjartr (Norse). The Domesday Book records several personal names which gave birth to this surname: Chilbert, Ghilebrid, and Giselbert. One of the earliest people bearing the name as a surname was Willemus Gilberti, recorded in the Curia Rolls of Wiltshire in 1202 AD. The Hundred Rolls of 1273 AD, a census of Wales and England, known in Latin as Rotuli Hundredorum, documents the existence of the following people bearing this last name: Isolda de Gilberti, Robert Gilbertus, and Eustace filius (son of) Gilebert. The Poll Tax of Yorkshire from 1379 records one Johannes Gilberd. In the same year, the Poll Tax of Howdenshire records one Nicholas Gilberdson. A one Anna Gylberte was baptized in 1548 at St. Michael’s Cornhill. Bernard Burke’s book “The Landed Gentry” discusses this three branches of this family: Gilbert of the Priory, Gilbert of Treslissick, and Gilbert of Cantley. The first family begins with a mention of Walter Raleigh Gilbert, Esq. of The Prior Bodmin in Cornwall. 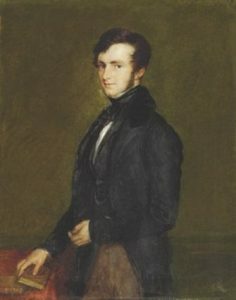 He was born in 1813, and in 1848, he married Mariamne Charlotte Isabella, the eldest daughter of William Peters of Ashfold, and had four children with her: Walter Raleigh (1849), Mary Mariamne, Cecilia Isabella, Edith Geraldine. This family owned lands in Manadon in the time of King Edward the Confessor (reigned from 1042-1066 AD). They descended down into honourable houses: Champernon, Croker, Hill, Chufleigh, Agar, Molineux, Pomero, Grenvils and many others. They also married into the Compon, Valetort, Reynward, Trenoch, alias Littleton (alias Westcott Kelly). Otho, also known as Otis Gilbert, was the High Sheriff in Devonshire during the reign of King Edward IV of England. Otho inherited Greenway, a locale near Darthmout, and he had three sons: Sir John, Sir Humphrey, and Adrian. 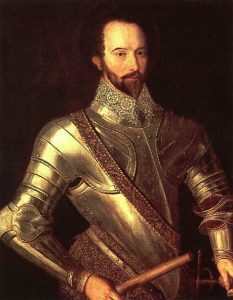 The middle son, Sir Humphrey Gilbert, was knighted in 1577, and was distinguished by his discoverties in the northern seas, where the Gilbert’s Straits are named after him, and he helped establish the colony of Newfoundland. This seaman was the half-brother of the famous Sir Walter Raleigh. He married Anne, daughter of Sir Anthony Agar, and had one daughter and nine sons with her. The eldest was Sir John Gilbert, who married a daughter of Sir Richard Molyneux of Sefton. His brother was Raleigh Gilbert, Esq. of Compton, who married Miss Kelly and left a son and successor: Agar Gilbert. Agar married Christian Walrund, and had with her issue: Elizabeth (married Thomas Hicks) and two sons, John and Humphrey. Humphrey succeeded his father at Compton Castle and married Joan, the daughter and co-heir of Roger Pomeroy, and had three sons with her: John, Humphrey, and Raleigh. His son John sold the ancient seat at Greenway, and he married Anne Courtenay. He had eight daughters (Anne, Henrietta, Catherine, Urania, Johan, Maria, Elizabeth Margaret, and Lucy) and four sons (John, Pomeroy, Courtenay, and Humphrey). Pomerpy Gilbert, Esq. of Compton Cast;e married Mary, the daughter of Admiral Edmund Williams, and had with her three daughters (Mary, Elizabeth, Lucretia) and five sons. 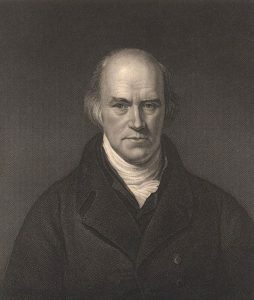 The third son was Reverend Edmund Gilbert, Vicar of Constantine. 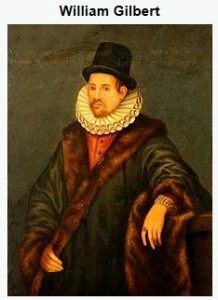 He married Anne Garnett, and with her had six daughters and six sons: John Pomeroy (his heir), Walter Raleigh, Henry Garnett, Edmund William, Roger Pomeroy, Francis Yarde, Catherine Hodgson, Elizabeth Garnett, Mary, Lucy, and Frances Isabella. The second branch discussed is Gilbert of Trelissick. It begins with a mention of Carew Davies Gilbert, Esq. of Trelissick, Cornwall, and Eastbourne, Sussex, who was a co-heir of the Baron of Sandys. He was born in 1852 and succeeded his father in 1854. In discussing the lineage, Burke states the Gilberts are an old and well-connected family in Sussex, who descended (in the female line) from the Vallers, Parkets, Normans, Fosters, Normans, Gorings, Eversfield, and Gildridges. Davies Giddy, the only son of Reverend Edward Giddy, was born in 1767 and assumed the name and arms of Gilbert upon his marriage to Mary Anne, the only daughter of Thomas Gilbert, in 1808. He was prominent in the science and antiquities and became the Chair of the Royal Society. He had daughters, but was succeeded by his son, John Davies Gilbert, Esq. of Tredera and Eastbourne, born in 1811, and married Honorable Anne Dorthea in 1851, who was the eldest daughter of the 1st Lord of Carew. He left a son named Carew Davies Gilbert. The third branch discussed in the book is Gilbert of Cantley. The discussion begins with mentioning William Alexander Gilbert, Esq. 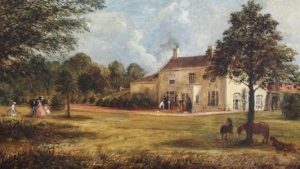 of Manor House, who was born in 1806 who married Maria, the daughter of John Bellamy Plowman, in 1829. He had two issues with her: William Alexander (born 1832) and John Bellamny (born 1834). He later married Mary Anne, the daughter of Reverend John Gilbert, and had ten children with her: Thomas Denny, Herbert Henry, Walter Edward, Francis Parnell, George Percy, Mary Anne, Alice Jane, Harriet Helen, Agnes Anne, and Gertude Maria. Burke traces the lineage of this branch back to Thomas Gilbert, a Gentleman of Chedgrave, in county Nofolk who was born in 1694 and claimed descent from Thomas Gilbert of Burlingham who received a grand of arms from Queen Elizabeth of England. Thomas married Elizabeth, the daughter of James Utting, and with her had five daughters and sons. His youngest son was Henry Gilbert, Esq. of Postwick Hall who was born in 1740 and married Anne, daughter of James Jenner, in 1771. He had numerous issue with her: Thomas, William Henry, Robert, and John. He died in 182 and was succeeded by his eldest surviving son, William Henry Gilbert of Cantley. William was born in 1774 and married Elizabeth, daughter of Alexander Woods, and had issue with her: William Alexander (discussed above), Henry Robert (1811), Elizabeth Ann, and Sarah. He padded away in 1832. The book “The Genealogical Guide to the Early Settlers” lists five early Americans bearing this surname. The first is Humphrey Gilbert, of Ipswich in 1648, who passed away in 1658, leaving a widow named Elizabeth, who married William Raynor and had issue with her. The second is John Gilbert, of Dorchester, who likely came aboard the John and Mary in 1630.He had sons Thomas, John, and Giles or Joseph (likely). He removed to Taunton in 1637 and was a representative there in 1639. He died in 1654, leaving a wife named Winifred. His will also mentions one daughter named Mary Norcross. The third is John Gilbert, who was born in England and came to Hartford, Connecticut. In 1647, he married Amy, the daughter of Thomas Lord, and before dying in 1690, left numerous children: Thomas (1658), Joseph (1666), Joseph (1666), James, Dorothy, John (1648), John (1653), Elizabeth (1656), and Amy (1663). The fourth is Jonathan Gilbert, of Hartfort, CT, who was the born in England and was the brother of the aforementioned John. In 1646, he married Mary, the daughter of John White or Whight, and had numerous children with her: Jonathan (1648) and Mary (1649),. His wife died and in 1650, he married Mary Welles of Hadley and has children with her as well: Sarah (1651), Mary, Lydia (1654), Thomas (1655), Nathaniel, Samuel, Ebenezer, Esther, and Rachel. He was a prominent figure in the community, operated an inn, and was marshal of the Colony for numerous years, who died in 1682. The fifth Matthew Gilbert, of New Haven in 1638. He was assistance of the colony in 1648 and deputy governor in 1661. He died in 1680 and left children John (1644), Sarah (1646), Rebecca (1649), Matthew, Samuel, Mary, and Hannah. The sixth person mentioned in the book is William Gilbert, a freeman of Windsor in 1640. The seventh and final bearer listed is William Gilbert, of Boston, Massachusetts, who was a merchant and cordwainer in 1675. He married Rebecca and with her had three sons (one named William) and a daughter named Mary. A one Robert Gilbert left the port of London in May of 1635 to Virginia aboard the Plaine Joan. Roger and Henry Gilbert came to Virginia in the same year aboard the Safety. Thomas Gilbert came to Barbados aboard the Expedition in 1635. A one Godfree Gilbert was documented as a servant belonging to Mr. William Bulkly in the Ketch Nepture. A Robert Gilbert was recorded in January 1678 as buried in the parish of St. Michael’s in Barbados. Other early American settlers include Bond Gilbert (Massachusetts 1772) , Richard Gilbert (Maryland 1633 or 1634), and Anthony Gilbert (Pennsylvania 1732). The family mottoes include: 1) Mallem mori quam foedari, meaning “I would rather die than be disgraced”, 2) Pro Christo et patria, meaning “For Christ and my country”, 3) Tenax propositi, meaning “Firm of purpose” (used by Gilbert of Cantley Hall), 4) Teg yw Heddwch, meaning “Peace is beautiful”. Famous people with this last name include: 1) Albert Carlton Gilbert (1884-1961) who was an American athlete, inventor, and businessmen in the toy industry best known for the Erector Set, 2) George Gilbert (1559-1583) who was an activist and Roman Catholic in England and Jesuit, and 3) Jean Gilbert (1870-1943) who was a German conductor and Composer.